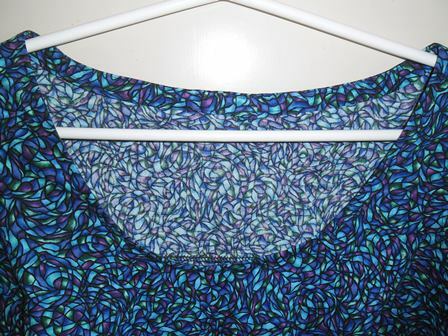 When I started my sewing frenzy in August / September the first item I made was this top as I had it cut and ready to go. I don’t wear woven tops so this was stepping out of my comfort zone. The fabric I used was a cotton I found at my small local fabric shop. I fell in love with this fabric straight away and thought it was perfect to play around with this top pattern for the first time. I made a combination of View A and View B of the pattern. View A has a bottom band piece at the front and a plain back. View B has a plain front and pieced back. I made plain back and plain front. I was wanting to make it as simple as possible and let the fabric be the star. I have a couple of fitting issues with this top. As mentioned in the Concord post I have the rounded shoulder issue. There is a lot of gapping at the back of this top. 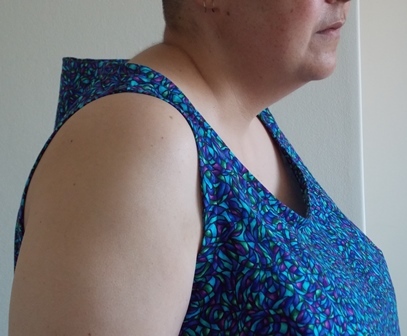 I started to make a draft version of this top at the Cashmerette retreat and due to me having a hollow chest we adjusted the pattern to take out some of the front neckline but we never did anything to the back. I dare say my rounded shoulders have gotten worse since the start of this year. I haven’t yet done the research on how to make the adjustment to correct patterns for it but it is something that when I get time I am going to learn. As you will see from the next photo there is a lot of fabric at the back! This photo makes me laugh cause it looks so wrong. I can laugh at myself its ok. It looks like I am wearing one of those shoulder guards motor cyclists wear! Clearly too much excess fabric there. Stitching wise I stuffed up my darts. I’ve made them too pointy. Due to this print I can probably get away with it but next time I finish my darts I need to do them better, I think the trick is that you stitch back into the excess fabric you have just folded out. This top has its faults (purely mine not the pattern) but it is still a wearable top. Once again I will wear a jacket or buttoned shirt over it and it will hide the mountain of fabric I have at the back and flatten my darts. As mentioned I haven’t worn it yet, I’m not sure why I think it cause I’m am so used to grabbing a knit t-shirt when I’m planning out my wardrobe and I forget that I now have this. I will try and remember to wear it over summer. Under my work jumper it will be nice due to it being sleeveless. It is ticking all the points. I have used a cotton fabric in a classic style. Even though it is a woven top it is comfortable, I can move my arms easily and I don’t feel restricted. The print is certainly quirky. I will make this again. 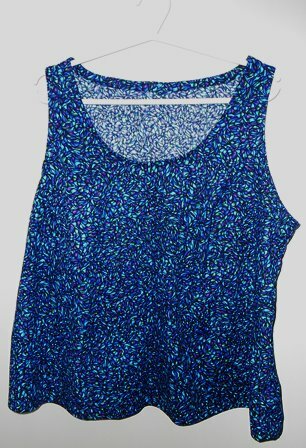 I have brought some lovely liberty fabric to make this top in but before I use that I might try another version first after I learn the rounded shoulder adjustment and learn how to do darts properly.